media archaeological fundus | What Is A Media Lab? What Is A Media Lab? Nostalgia is a very important “first trigger” for re-using old/dead/vintage hardware and software. But […] nostalgia isn’t really the energy for [users’] engagement because you can’t use an “old medium”: the moment you turn it on it is totally present/in presence. Stefan Höltgen runs the Signal Lab in Berlin as well as the Media Archaeological Fundus, founded by Wolfgang Ernst who is chair of Media Theory at the Humboldt University of Berlin. Can you start by telling us a bit about the Signal Laboratory – how did it start and what is the main function of the Lab? How does it relate to the Media Archaeological Fundus? 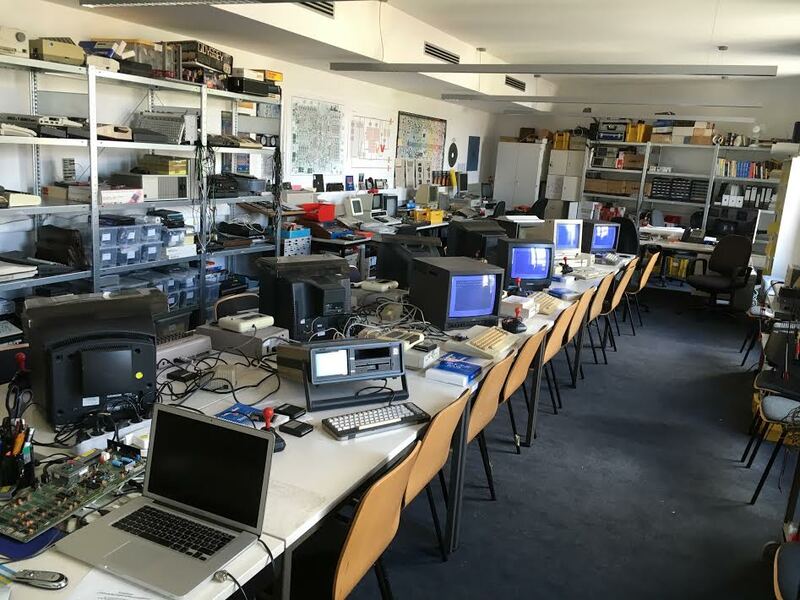 SH: The Signal Laboratory (SL) was founded 2003 as a lab for studying media hardware and their signals by opening them and measuring frequencies, sound outputs, and voltages. When I joined the Center for Musicology and Media Studies in 2011 I began to collect vintage computer hardware, peripherals, and software for my research project (“on the archaeology of the early microcomputer and its programming”) and as examples for my teaching lessons about hardware, programming and computer history. The SL soon became a place where my colleagues and I repaired and restored those old machines to learn about their functioning. That is the main difference from the Fundus, where media archaeological artifacts are collected and restored to function in principle which means: to show how their technology work(ed).The intersection between the SL and the Fundus is the question we both ask: How do those technologies relate to their history and their presence when you don’t look at them as economical, techno-historical, or social (e.g. the effects on the user, the society …) gadgets but as “signal processing” media – where the media in the SL are mostly produce programmable digitally coded signals and those of the Fundus are of both sorts: analogue and digital – but not programmable. Following the boom concerning “Media Labs” (at MIT and then other places too) in the 1980s, we are now building more and more Humanities Labs – some connected to Digital Humanities, some to Design, some to other sorts of Humanities spaces and activities. How does the Signal Lab relate to the broader theme of labs in contemporary humanities that are being faced with the technological (as Kittler has noted)? SH: There are no actual research connections to those kinds of labs. But when we come to the point of the SL as a teaching space I think we are doing basic work for people who want to work in those technologically “infected” humanities labs: We are teaching electronics, programming, and topics of the informatics/computer sciences from the viewpoint of media theory. So our students won’t become proper programmers but merely hackers that are able to estimate the technological connections between the medium (especially electronic computer) and its user. A more specific connection lies with technological practices – critical design, DIY, the maker movement and more. Furthermore, the existence of “Fablabs” has gathered momentum over the past years in different contexts. What are the specific connections and disconnections to such labs that also engage with a “making”, hands-on approach to technology, but seem to be built on different premises (not least, around much talked about kits like 3D printers, laser cutters, and various other sorts of technologies)?